We’d love your help. Let us know what’s wrong with this preview of Dandelion Dead by Chrystle Fiedler. In a spicy cozy mystery filled with herbal remedies readers will love, a sustainable winery becomes the backdrop for murder! Fortunately, solving crimes comes naturally to charmingly unconventional naturopath and amateur sleuth Willow McQuade, as she looks for clues that will reveal a killer's true essence. Business is blooming at Nature's Way Market & Cafe, and shop ow In a spicy cozy mystery filled with herbal remedies readers will love, a sustainable winery becomes the backdrop for murder! Fortunately, solving crimes comes naturally to charmingly unconventional naturopath and amateur sleuth Willow McQuade, as she looks for clues that will reveal a killer's true essence. Business is blooming at Nature's Way Market & Cafe, and shop owner and naturopathic doctor Willow McQuade has never been happier. Her new medicinal garden is a hit with villagers, and she's helping her ex-boyfriend Simon and husband-and-wife team David and Ivy create Pure, an organic winery powered only by wind and sun. To ask other readers questions about Dandelion Dead, please sign up. Life has been good lately for Willow McQuade. Her store is producing a good business and the community has fully embraced her medicinal herb garden. Her relationship with Jackson Spade is strong and her best friend Simon is thriving as a new vineyard owner. The best news, though, is that it has been about a year since Willow, Jackson, and Simon have needed to put their sleuthing skills to work. Unfortunately, all of that changes when Amy Lord - sister-in-law to Simon's business partner, David, i Life has been good lately for Willow McQuade. Her store is producing a good business and the community has fully embraced her medicinal herb garden. Her relationship with Jackson Spade is strong and her best friend Simon is thriving as a new vineyard owner. The best news, though, is that it has been about a year since Willow, Jackson, and Simon have needed to put their sleuthing skills to work. Unfortunately, all of that changes when Amy Lord - sister-in-law to Simon's business partner, David, is found dead during a party at Pure (Simon's vineyard). At first inclined to stay out of the investigation, Willow is pulled in when it appears that David was the intended target and not Amy. And whoever is behind the murder is not done killing yet. I jumped in at the middle again – this is book #4 in the series, but the first one that I read. Although some characters did share a history, I had no problem figuring out who was who, or how they related to each other, so you don’t have to have read the earlier books to enjoy this one. Cafe owner Willow, her animal rescuer boyfriend Jackson, and winemaker (and Willow’s ex-boyfriend) Simon are a great team. Each brings a unique set of qualities to the table, and they work well together.When Lily, I jumped in at the middle again – this is book #4 in the series, but the first one that I read. Although some characters did share a history, I had no problem figuring out who was who, or how they related to each other, so you don’t have to have read the earlier books to enjoy this one. Cafe owner Willow, her animal rescuer boyfriend Jackson, and winemaker (and Willow’s ex-boyfriend) Simon are a great team. Each brings a unique set of qualities to the table, and they work well together.When Lily, one of Willow’s employees, is accused of murder as well as a second attempted murder, the police are convinced that there’s no need to look for other suspects. The three friends decide to investigate on their own, both to keep Lily out of jail, and to stop the real killer from finishing the job he started. 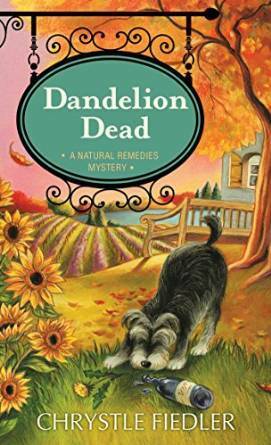 Dandelion Dead is a fun read, both for the mystery and the info on edible plants and natural remedies. Willow and Jackson are back, this time Willow's ex (and now great friend) Simon is part owner of a vineyard and it could be up for an award in the North Fork Uncorked festival. The problem is that someone is threatening his business partner David and then at their opening bash for the festival David's sister-in-law ends up dead (having eaten food prepared for David! ), it turns out that not all is sweetness and light in David's world and Willow's assistant Lily is in the Police sights as the murd Willow and Jackson are back, this time Willow's ex (and now great friend) Simon is part owner of a vineyard and it could be up for an award in the North Fork Uncorked festival. The problem is that someone is threatening his business partner David and then at their opening bash for the festival David's sister-in-law ends up dead (having eaten food prepared for David! ), it turns out that not all is sweetness and light in David's world and Willow's assistant Lily is in the Police sights as the murderer. I liked this one a lot. I couldn't figure out the killer. I can't wait to read the next one in the series. This cozy mystery kept me guessing who did it until the reveal. I'm not going to say it was a complete surprise, but the bad person was skillfully hidden. I do admit I like that. Many books I read I know who the villain is chapters before the big reveal. Here not so much. The book is filled with "natural remedies" and vegetarianism, not enough to be preachy but more than I cared for. Natural remedies are fine, I guess, but not when you're allergic to many of the plants, which I am. They could hav This cozy mystery kept me guessing who did it until the reveal. I'm not going to say it was a complete surprise, but the bad person was skillfully hidden. I do admit I like that. Many books I read I know who the villain is chapters before the big reveal. Here not so much. The book is filled with "natural remedies" and vegetarianism, not enough to be preachy but more than I cared for. Natural remedies are fine, I guess, but not when you're allergic to many of the plants, which I am. They could have been left out and it wouldn't have damaged the story. Still giving the book a 5 star because it hid the conclusion so well. Love this fun series centered on natural cures from herbs and other plants. I'd love to try some of the recipes she posts..well scrubbed dandelion roots sautéed in sesame oil and tahini... but I'd probably be the dunce who picked the poisonous plant instead. Lots of action and excellent characters. I wish the cops weren't quite so stereotypically dense, but I guess that is the humor in the piece. I believe in eating healthy but this book felt like I was reading a lecture on healthy veg. diets --- boring and not to my liking at all --- got a third of the way through it and just gave up! This is the first book I've read from this author and I must say I have really been missing out. I loved the part about the animal rescue that Jackson runs. He is the boyfriend of Willow McQuade. The author really brought a growing problem that plagues cities into the limelight as she spotlights animal rescue. I love animals and when I visit an animal shelter, I want to take them all home with me. Jackson is a great character and his desire to help the animals is a welcome addition to the story. This is the first book I've read from this author and I must say I have really been missing out. I loved the part about the animal rescue that Jackson runs. He is the boyfriend of Willow McQuade. The author really brought a growing problem that plagues cities into the limelight as she spotlights animal rescue. I love animals and when I visit an animal shelter, I want to take them all home with me. Jackson is a great character and his desire to help the animals is a welcome addition to the story. Willow is a very fascinating character and I wanted to follow her around as she picked up wild plants and described how they could be used. The author has really done her research and the details of the edible plants shows her knowledge and helps the story flow with ease. The story picks up speed as Willow caters a party. There are very distinguished groups at the party all vying for the $200,000.00 prize given by Wine Lovers Magazine. There are verbal fights going on throughout the venue and some are becoming quite heated. As the wine begins to flow , the crowd starts to get antsy and some of the guests are getting out of hand. I loved how the author brought several characters together and showed how jealousy and insecurity can really make for some heated conversations. The tension in the room was building and you could feel something was going to happen any minute. Willow tries to step in to quiet the outbursts, but it doesn't do much good. It is time to bring her rugged good looking ex-cop Jackson into the mix to control the crowd. I could picture the room in almost chaos and feel the tension that was so thick as voices became louder and the tension grew stronger. The scream was one of disbelief and pain as Ivy saw her sister laying on the floor dead. Just minutes before they were arguing, now one of them was dead. Did Ivy kill her sister? The guests were being detained as the police start their investigation. Willow is warned not to snoop around and try to solve the murder. Of course that doesn't stop her and off she goes with Jackson and her friend Simone on another adventure that will have them chasing clues, twists and turns and an unforgettable whodunnit mystery. Was Amy the target of the killer? How did she get poisoned? Get ready for a great mystery that is action packed, filled with surprises and an ending you don't see coming. The recipes at the back of the book is a great addition along with information about animal rescue. I'm excited that I have found a new and exciting author to read. Dandelion Dead, by Chrystle Fiedler, is the fourth book in the Natural Remedies series. Even though this is the fourth book in the series, it can be read as a stand-alone book. Ms. Fiedler did an excellent job of giving the reader enough background information on the characters so you do not miss out on anything happening in the story. Willow McQuade wears many hats, owner of Nature’s Way Market and Café, holistic doctor, animal rescuer and part time sleuth. It all starts when Willow is catering Dandelion Dead, by Chrystle Fiedler, is the fourth book in the Natural Remedies series. Even though this is the fourth book in the series, it can be read as a stand-alone book. Ms. Fiedler did an excellent job of giving the reader enough background information on the characters so you do not miss out on anything happening in the story. Willow McQuade wears many hats, owner of Nature’s Way Market and Café, holistic doctor, animal rescuer and part time sleuth. It all starts when Willow is catering an event for Pure, a local winery, run by her ex-boyfriend Simon. All is going well, at least on the surface, until during the party the body of Amy Lord is found and it is discovered that she died from ingesting poison hemlock. Amy is the sister-in-law to Simon’s business partner David. The leading suspect in the case is Willow’s assistant Lily and the police are convinced they have their killer since Amy had both motive, opportunity and the knowledge of poisonous plants. With the police refusing to look for another suspect, the trio of Willow, Simon and Willow’s boyfriend Jackson team up to put their amateur sleuth skills to work. What they uncover is a tangled web of lies, jealousy and deceit. They suspect that David was the real target and not Amy. As they try to unravel the mystery of Amy’s death there are additional attempts on David’s life confirming their theory and spurring them on to discover who the real killer is. There are several interesting twists that made the story very compelling. The back stories of the characters were very thoughtful done and gave the story a real believability. The pace of the story was good and I particularly liked how all the lives of the characters were intertwined. All in all, this book is a great cozy mystery. I really loved all the herbal lore and remedies in the story. The author’s love of herbs and holistic remedies really shows in this book. Anyone who loves mysteries is bound to fall in love with this one. Looking forward to reading more by this author. Disclosure: I received a free copy of this book in return for my honest review. Please see my blog at https://thespineview.com for this review and others. I have never enjoyed a cozy mystery as much as I enjoyed this one. I wish I would have started this series years ago! Willow is a wonderful holistic character, and I love that she is natural remedy inclined. The murder in this book made me sad, as it did all the characters, it was one that we all seemed to like. But good and bad have to die in the name of a good mystery. good easy book to read, interesting ending. I have been writing since I could pick up a pencil. When I was a kid, I wrote plays and even musicals. When I was a teenager I wrote children’s books, in college, I learned how to write like a journalist, and when I moved to L.A. in 1993, I wrote movie and TV scripts. In 1998, when I moved from Hollywood back home to Greenport (the setting for the natural remedies mysteries) I was happy to be fina I have been writing since I could pick up a pencil. When I was a kid, I wrote plays and even musicals. When I was a teenager I wrote children’s books, in college, I learned how to write like a journalist, and when I moved to L.A. in 1993, I wrote movie and TV scripts. In 1998, when I moved from Hollywood back home to Greenport (the setting for the natural remedies mysteries) I was happy to be finally be able to combine my interest in natural remedies and journalism. Over the past ten years I have written about conventional and alternative health topics for many national publications including Natural Health, Vegetarian Times, Better Homes & Gardens, Remedy, and The Health Monitor Network. I was also the Good Nature columnist for Remedy magazine from 2006-2009. In 2008, I began writing non-fiction including The Complete Idiot’s Guide to Natural Remedies (Alpha, 2009), co-author of Beat Sugar Addiction Now! (Fairwinds Press, 2010 4th printing) with noted holistic physician Jacob Teitelbaum, M.D., and the Beat Sugar Addiction Now! Cookbook (Fairwinds Press, 2012) and The Country Almanac of Home Remedies (Fairwinds Press, 2011) with noted herbalist Brigitte Mars. So it was only “natural” that when it came to fiction I wanted to incorporate my love for natural remedies into a cozy mystery. In 2011, my life-long dream came true when I was offered a contract for Death Drops: A Natural Remedies Mystery, and three sequels, Scent to Kill, Garden of Death and my new book Dandelion Dead from Pocket Books/Simon & Schuster. When I’m not writing, I’m spending time with family and friends, my two dachshunds Wallander and Murdoch, my two cats Tinker and Tuppence, gardening! being a complete and total Anglophile!, and enjoying mysteries! on TV, in books and on my Kindle in my cozy cottage by the sea.